The Cascadia Seminar is an experiment in creating a new kind of intellectual space for medical anthropology in the “Cascadia” region (i.e., the US Pacific Northwest and British Columbia). The Cascadia Seminar is a small, intimate, high-interest, low-cost weekend conference organized collaboratively by medical anthropologists on faculty at a number of different universities and colleges in the US Pacific Northwest and British Columbia. 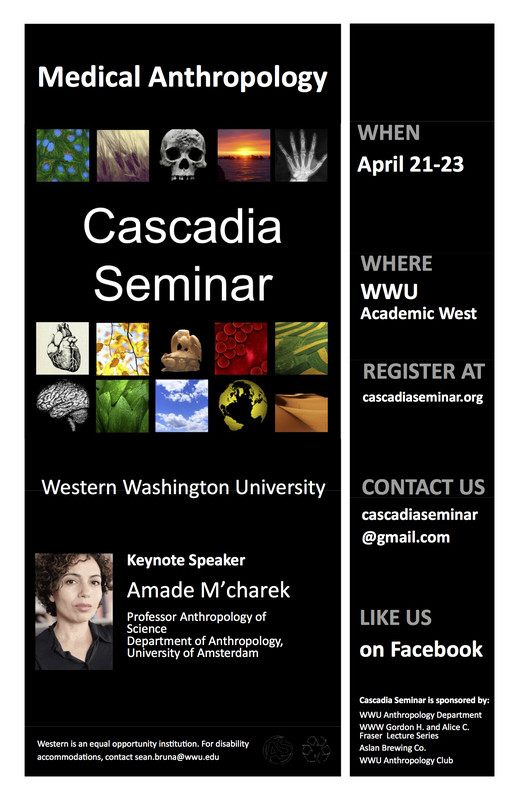 The Cascadia Seminar will begin the evening of Friday April 21, 2017 with a keynote address by Amade M’charek, Professor of Anthropology of Science at the Department of Anthropology at the University of Amsterdam (website: http://www.uva.nl/en/about-the-uva/organisation/staff-members/content/m/-/a.a.mcharek/a.a.mcharek.html). Four papers will be presented on Saturday April 22nd, and three on Sunday, April 23rd, with no concurrent sessions. Each paper presenter will have forty-five minutes to present a substantial, well worked-out paper, with ample time for lively discussion. All participants are encouraged to attend all papers, and optional no-host meals together will offer additional opportunities for conversation. The WWU Anthropology Department will provide coffee & snacks. Abstracts were reviewed by a committee of medical anthropologists on faculty at our various institutions, all of whom also plan to attend. Seven paper abstracts were selected, seeking papers that promise to be ethnographically rich and intellectually exciting. The registration to the conference is free of charge, though pre-registration is required in order to keep numbers manageable. A limited number of hotel rooms are available at a reduced rate at the Hotel Bellwether and Guesthouse Inn. Please see the accommodations page for details. We look forward to a stimulating and fun weekend! Amade M’charek is Professor of Anthropology of Science at the department of Anthropology at the University of Amsterdam. Her research interests are in forensics, forensic anthropology and race. She is the PI of the project Dutchness in Genes and Genealogy, a project examining how Dutchness is enacted in collaborations between population geneticists, archaeologists and genealogists. M’charek is also the PI of the project Sexuality & Diversity in the Making. She is the founding chair of the European Network for the Social Studies of Forensics (EUnetSSF) and the convenor of the seminar series Ir/relevance of Race in Science and Society. Her most recent research is on face making and race making in forensic identification, for which she received a five-year ERC consolidator grant in December 2013. Learn more about Dr. Amade M’charek at her website. (Sur)Face: Notes from forensic identification on race and sameness. In this paper I explore the production of sameness and its relation to race by attending to the bioligization of the phenotype in forensic identification. It has been widely observed that while the human genome speaks to the communality in the genes, the alleged 0,1% of genetic difference has become the prime object of attention in the life sciences. And as these things go, the 0,1% of difference has also caught the attention of an ever-growing scholarship in the social sciences and the humanities. It has been argued that while genetics is not upfront about racial classifications, its technologies and methods are contributing to the molecularization of difference and the production of race. Race thus dived under the sur-face. In my paper I want to make two related interventions. First I will argue that rather than a molecularization, a zooming-in into the body, we are witnessing a growing interest for the surface of the body. We are witnessing the return of the phenotype. In genetics the phenotype (physical appearance) is increasingly biologized. I will draw on examples from forensic genetics and show the growing interest in the biology of the phenotype and particularly the biology of the face. I will argue that the giving of a face to an unknown individual (suspect or a victim), the aim of DNA-phenotying technologies, goes hand in hand with the doing of race. Second, genomic research on human variation and its emphasis on markers of difference contributes to an idea that whereas differences are produced, similarities and sameness are given. Indeed, an emphasis on difference seems to suggest that in the context of race, differences might be political or a negative while similarities are curiously apolitical. The production of sameness, resemblance and equivalence has thus received little attention in critical analyses. In my paper I will to switch the focus from difference to sameness and explore its potential for understanding race.The well known case of Marianne Vaatstra will figure as my prime example to unpack the politics of sameness. Abstract: In parts of Northern Ghana, a small number of infant and child deaths are facilitated by family members and ritual specialists. In these cases, deformed or ailing infants, those whose births were concurrent with tragic events, or children displaying unusual abilities may be regarded as spirits sent from the bush to cause misfortune and destroy the family. From the Nankani peoples perspective, spirit children are not human, but are bush spirits masquerading as such. Community members, health researchers, and development workers offer diverse interpretations of spirit child phenomena ranging from primitive ritualistic murder to a local form of euthanasia for sick children. Too often, individuals and intervention programs impose interpretive frameworks that do not consider the experiences and moral worlds of local families. Drawing on ethnographic research into the spirit child phenomenon, I engage the Nankani peoples perspectives on infanticide alongside the development discourse and interventions enacted to prolong life. First, I consider the provision of care in medically hopeless circumstances. Scholars across global contexts have questioned imperatives and attempts to save the lives of poor children that might not otherwise survive, since such efforts, if successful, can result in increasing human misery, particularly if long-term support services are unavailable. Hence, are some Nankani infants that would otherwise be killed or die in the absence of specialized intervention better off not receiving life-prolonging care? Second, building on the discourse of intervention, I explore the spirit child practice as a form of euthanasia. Are the deaths of spirit children a culturally-specific form of euthanasia for children of uncertain viability? The euthanasia question is seductive, as it is an easy way to soften and potentially humanize an infanticide practice that presents to some people a set of uncomfortable realities. But does euthanasia actually fit this context and practice? Moreover, what is revealed or concealed by framing it as an act of euthanasia rather than infanticide alone? The Nankani perspective is central to these questions. Ultimately, this presentation emphasizes the political-economic and culturally bound nature of euthanasia and the ethical issues present in euthanasia talk in resource-poor settings. Abstract: This paper explores ethnographically how personhood and time are intertwined in the face of dementia, building on over a years fieldwork in memory clinic and nursing home care in Denmark. Spanning medical practices of diagnosing and treating early-stage dementia, and nursing home practices of caring for people with late-stage dementia, the paper attends to the ways in which clinicians, caregivers and relatives of patients and residents mark out temporalities for dementia sufferers. Drawing on historian Reinhart Koselleck and his distinction between prophetic and prognostic conceptions of time, I pinpoint a tension: Dementia is enacted in the memory clinic as a condition of progressive decline, thereby constituting an indispensable prophecy of future discontinuity of personhood and life; yet dementia is approached clinically as a prognosis that renders the future indeterminate and open to (medical) intervention. Operating within this tension, relatives of patients seek to enlarge a narrowing truncated-cone-shaped future that comes to colonize and melt away the present moment. Clinicians and relatives experiences of personhood and life amalgamate with the shape of time, configuring the person with dementia as inescapably diminishing remains (prophecy) to be restored (prognosis). While relatives carry out the care work in early and moderate stages of dementia, nursing home care marks a shift in responsibility for maintaining precarious lives within the welfare state. Here caregivers engage to create magical moments for residents by establishing them as continuous persons. I argue that the transition into nursing home care installs a new temporal beginning from where caregivers practice time and personhood for dementia sufferers, thereby redefining and reframing progress and decline. Further, I discuss how scientific and political pushes for earlier diagnostics of dementia constitute means to govern decline within a temporal frame of welfare state or even global world progress. Although diagnoses allow for intervention, this ethnography urges recognition of the moral ambiguities that knowledge of dementia places locally in individual lives of patients and relatives. Without effective treatment or cure, early knowledge of dementia should not automatically be the default pathway to useful presents and futures. Abstract: In the midst of fieldwork on medical imaging in Phnom Penh, Dr. Chey, an obstetrician at a maternity hospital, reminded me of the three Ms of a medical problem: mdecin, machine, malade (the doctor, the machine, and the patient). We were talking about color ultrasound imaging, and he explained that color is important for depicting fluid flow, but when purely ornamental, such as background tint, color can actually obscure clinical information. This disrupts the delicate alignment of the three Ms required to practice good medicine. In the x-ray waiting area of a large public hospital in Phnom Penh, a young man held a film of his grandmothers chest up towards the light streaming in from the open windows. Minsauv chbas, he said, “Its not really clear.” Did this indicate a malignancy of the body? Or did it have to do with the skill of the technician? Or perhaps the quality of the machine or the film? The x-ray image called attention to itself; it points beyond itself, too. To the grandmothers lungs–the object of the image–but also to the machine, the film, the doctor, the hospital. It does so, in part, because of the way it looks. Not clear. In this paper, I follow doctors and patients concerns with the aesthetic qualities of medical images, such as color and clarity, to explore how imaging intervenes into medical practices and understandings of the body. I juxtapose studies of biomedical imaging, in which the social construction of technology is a problem for depicting biological realities, and studies of photography in Asia, in which the imager, camera, and subject work in intra-action to reveal potential qualities rather than capture reality. I do so to further our understandings of the ways aesthetic conventions and expectations shape imaging and health practices. Abstract: Critical Medical Anthropology (CMA) developed in the 1980s as a Marxist critique linking the structural oppression (also termed ñstructural violence) of capitalism and imperialism to the study of health, medicine and disease. CMA scholarship sought to reorient medical anthropology beyond the confines of clinical space to explore how class stratification creates poor health conditions for workers and other oppressed populations. In keeping with these goals, research in CMA has involved three interrelated projects: 1) class based analyses of health, including disparities between imperial powers and post-colonial states; 2) critiques of the limits of bourgeois medicine under capitalism; 3) descriptions of the way health and medicine have been positively transformed in socialist states. This research agenda remained in place even after the post-Soviet transitions of the 1990s, and there has been no retrospective assessment of CMA from a post-Soviet perspective. This paper proposes to revisit and update key assumptions in CMA by using post-socialist scholarship to explore the political economy of inequality and health in post-Soviet spaces. Many of these regions have experienced reduced life expectancy and outbreaks of disease over the past two decades, and these trends have been driven in part by instability, corruption, environmental degradation and high rates of organized crime activity. The Marxist vocabulary of CMA, however, remains oriented around binary categories of socialism and capitalism that do not accurately describe the unique structures of violence that have emerged in the aftermath of the USSR. Some post-Soviet states, for instance, have been termed mafiacracies or failed states due to the complex interpenetration of racketeering with institutions of governance. Others have experienced resurgent outbreaks of preventable infectious disease due to entrenched corruption in the health sector or political instability driven by warlord insurgencies. For CMA to remain relevant in the twenty-first century, it must update and expand its vocabulary to address how these post-Soviet structures of violence impact human health and create unique forms of suffering. Abstract: Imagine hailing from a resource-poor community experiencing an outbreak of a deadly communicable disease at a time when you are residing abroad thousands of miles away. What recourse would you have to intervene on behalf of your loved ones back home? This was the precise predicament faced by thousands of Liberians, Sierra Leoneans, and Guineans living abroad during the 2013-2016 West African Ebola outbreak. The overwhelming sense of impotence many felt during this time mobilized them as never before to build and repair health centers, train health workers, and bring medical supplies to their home communities in West Africa. Although their initiatives called diasporas for development or diasporic medical philanthropy join a long history of such efforts, medical anthropologists have yet to examine in-depth the meanings and transactional logics of such diasporic health philanthropy. Nor have medical anthropologists studied ways in which this form of health aid differs from or replicates aid delivered by traditional agents of development, or how it is assessed by the wider public and home communities at the receiving end of such giving. This paper, informed by a body of literature at the intersection of medical and political anthropology, presents findings from a five-year multi-sited research study that investigates the prospects, complexities, and biopolitical quandaries of diaspora-led medical philanthropy. The NSF-funded study was developed in the context of Africas human resources for health crisis and the ongoing legacy of neoliberal policies that obliged African governments to reduce public funding and support for health. Specifically, the paper will discuss results from an investigation of ten large-scale philanthropic health initiatives implemented by Ghanaian and Senegalese individuals living in North America and Europe whose aim was to improve the health of their compatriots back home in West Africa. By scrutinizing the life histories of these health initiatives, the study compares giving strategies and ascertains whether diasporic philanthropists integrate or eshew indigenous healing practices. Do they resist or provide further scaffolding for biomedical hegemony? Ultimately, are African diasporic philanthropists encouraging the ongoing devolution of the African state by providing services the state ceased to provide in its turn to neoliberalism? Abstract: Drawing from interviews and life histories, my paper considers a few atypical recollections of womens reproductive experiences during communist Romania enforced pronatalist policies. Under the dictatorship of Nicolae Ceau_escu, Romania had one of the strictest state-driven pronatalist regimes in the world, after Decree 770 was adopted in 1966. Abortion was legally banned, modern contraception was officially unavailable and women were submitted to mandatory gynecological controls. These policies produced a whole generation of unwanted children known as the children of the decree and disempowered millions of women by drastically restraining their reproductive rights. Unsurprisingly, the majority of Romanians remember Ceau_escu era reproductive experiences as painful and traumatic. Yet, as my paper demonstrates, ethnographically-based medical anthropology research reveals that past reproductive policies produced, in fact, a variety of responses from their intended recipients. For instance, women who fought infertility during pronatalism tend to have positive recollections of their pregnancy and maternity years. Unlike some of their counterparts from the eastern European communist bloc, Romanian women did not resist motherhood which was mostly seen in patriarchal terms as crucial to ones personal fulfillment and social recognition. The demographic interests of Ceau_escu regime enabled women to fight infertility, inadvertently replicating the very reproductive discriminations of traditional patriarchy against barren women that the communist ideology claimed to have dismantled. Pressured as they were to report high birth rates, obstetricians kept women who had fertility issues under strict clinical observation during much of their pregnancies so as to ensure live births. While these women acknowledge the unreasonable power relations that bounded doctors and patients to forms of biopolitical repression, they are nevertheless grateful that the workings of an authoritarian regime granted them with successful pregnancy outcomes. Considering the actual experiences of giving birth under enforced pronatalism for women with fertility issues can shed additional light to our understanding of the limitations of biopolitics in action. Ordinary citizens are not equally disempowered even when reproductive care takes place at the intersection between biomedically-enabled surveillance and political repression. Abstract: In this paper, I examine how understandings of under-nutrition and over-nutrition among health care practitioners and families differ both in definition and diagnosis; therefore perpetuating the health problems associated with malnutrition in Vanuatu. While much of the Pacific region struggles with high rates of obesity, the South Pacific island nation of Vanuatu remains poised in transition between hunger and obesity. Recent biomedical research indicates a link between childhood under-nutrition and subsequent adult over-nutrition. This trend has manifest clearly in the ni-Vanuatu population, particularly in the capital city, Port Vila. Ministry of Health and UNICEF data show that Port Vila residents have the highest country-wide rates of growth stunting among children under age 5, which is an indicator of chronic, long-term under-nutrition. In addition, Port Vila residents have the highest rates of overweight and obesity among adolescents and adults age 15-49 in the country. Some of the same problems that contribute to under-nutrition, including inadequate access to financial resources and the cash economy, and lack of land to grow crops, can lead people to experience the poor health outcomes of both under-nutrition and obesity. Residents in urban areas struggle to afford healthy, fresh produce from local markets, turning to cheaper, imported foodstuffs often with poor nutritional value. Drawing on ethnographic fieldwork, food diaries, and a visual-narrative elicitation project conducted between 2010 and 2016, I illustrate conflicting discourses of what it means to be malnourished. I problematize how public health workers and mothers define and analyze the concept of malnutrition, and call for a reexamination of how researchers and health care practitioners address the seemingly disparate phenomena of hunger and obesity. Results indicate that this problem is more than a lack or surplus of food, and needs to be situated in the context of local understandings and interpretations of healthy eating, food behaviors, and the financial situation of families and caregivers. I argue that linking VanuatuÍs efforts to combat obesity and under-nutrition would strengthen the effectiveness of both programs. I conclude with practical recommendations for donor agencies and public health practitioners working to promote healthy foodways for both young children and adults.